Bollywood lovers will soon witness the timeless magic of three of Bollywood’s highly-acclaimed legends performing together for the first time ever in their careers on one stage. Bollywood has always been about the music and the world premiere of LEGENDS OF BOLLYWOOD featuring Udit Narayan, Alka Yagnik, and Kumar Sanu will transport fans back to the enchanting scenes of their favorite Bollywood classics on 29 and 30 March in Durban and Johannesburg. Take a walk down memory lane and re-live some of the most popular romantic classics from the ’90s performed by these award-winning artists. With a wide repertoire of hit songs recorded over the years, this never-before-seen concert is something not to be missed. 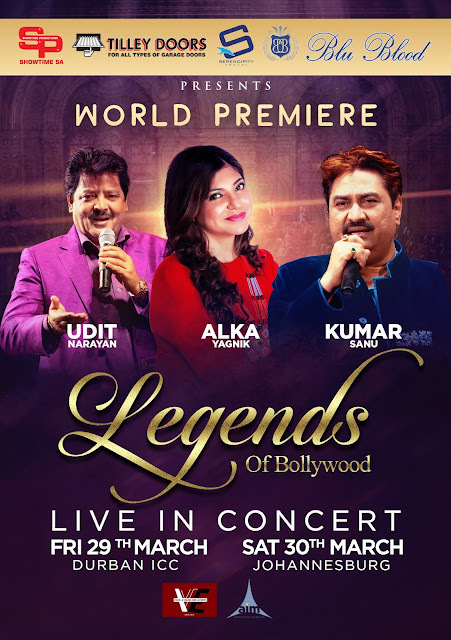 LEGENDS OF BOLLYWOOD is proudly brought to you by the leaders in entertainment, Blu Blood and Showtime Promotions. “We have always taken great pride when bringing international acts to South Africa and we are exceptionally excited to be hosting these three maestros in a world-first. This is music that Bollywood lovers across the world have grown up with. These are the artists that helped build the Indian film industry and their performances are always of a high caliber. We are expecting a very good turnout in both cities and we urge people to not wait till the last minute to purchase tickets for this unique performance,” comments Blu Blood MD, Osman Osman. Udit Narayan is an award-winning artist who has performed over 19 000 songs for Bollywood movies. With his melodious voice, Udit is one of India’s most popular playback singers and has sung for onscreen legends such as Shah Rukh Khan, Amir Khan and Salman Khan on tracks including ‘Papa Kehte Hain’ and ‘Dil Ne Yeh Kaha Hai Dil Se’. Alka Yagnik is ready to mesmerize the audience with her hit numbers such as ‘Kuch Kuch Hota Hai’ and ‘Mera Dil Bhi Kitna Pagal Hain’. She is noted in Indian cinema for a career spanning over three decades and she is a record seven-time award winner for the Filmfare Awards for Best Female Playback Singer; a two-time recipient of the National Film Award and several other honors. The Bollywood melody king, Kumar Sanu, will captivate the audience with his evergreen soundtracks of the ’90s with audience favorites ‘Yeh Kaali Kaali Aankhen’ and ‘Dheere Dheere Se Meri’. Sanu has won numerous film awards and other recognition for his illustrious career as a playback singer. Tickets from R300 are now available at Computicket. Blu Blood is personified in the form of Osman and Shaaista Osman, who have combined their expertise, experience, and enthusiasm as the two pillars of this lifestyle and management brand. Known for the professional event management services, they have hosted the biggest Bollywood productions including Atif Aslam, Sonu Nigam, Shreya Ghoshal, and Adnan Sami as well as crossing paths with renowned international and local artists including US actor/comedian, Orlando Jones, Azhar Uzman, Preacher Moss, Russel Peter, Joey Rasdien, Marc Lottering. They are the exclusive management house for Riaad Moosa, Tumi Morake and Ndumiso Lindi. Contact me at thelifesway@gmail.com or editor@thelifesway.com to collaborate on your products, events, and services. #TheLifesWay #PhotoYatra!